We’d love your help. 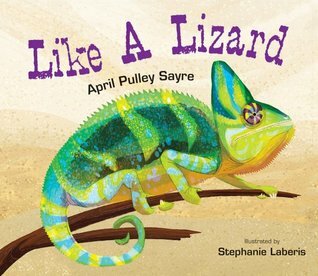 Let us know what’s wrong with this preview of Like a Lizard by April Pulley Sayre. The actions of 28 lizard species--the flying dragon that swoops through the air, the shingleback that sticks out its blue tongue to scare predators, the basilisk that can race across the surf The attributes of 28 different lizards are revealed in this STEM nonfiction picture book, while the story provides a subtle message encouraging children to be true to their own nature. To ask other readers questions about Like a Lizard, please sign up. Possibly the only picture book to show a lizard firing blood out of its eyeballs. 9/10 recommend. Easy to read non-fiction for lizard lovers. Illustrations are lovely and the simple wording packs in a ton of info on what lizards do.